Intelligence Super Stock Scanning System. New in market Intelligence Super Scanner allows developers to add scanning Their Trading System with just a few lines of code. Users can choose one of several pre-defined scans or they can create their own scanning strategies. The Super Scanner works in real-time, tick-by-tick, and scans thousands of symbols based on custom criteria. All scanning occurs on the server side so that the client software or website client can be extremely thin! Super Scanner features fully automated trading capabilities through the brokerage of your choice . Users can share strategies with other Intelligence Super Scanner users and users can link multiple strategies together. Intelligence Super Scanner does not use a scripting language or "drag-and-drop" interface. The patent-pending is so easy to use, so intuitive, that anyone can use it without needing to refer to documentation. Strategies can be saved on the local computer, allowing the end user to create an unlimited arsenal of strategies and signals. Workspaces allow for multiple screens, which contain all signals, signal chains and filters. This allows the end user to have multiple strategies per workspace for parallel running of strategies (the software is multi-threaded). The filters section lets users combine signals or group of signals or even signal chains and further filter the signals by specific criteria. For example you can find stocks that are crossing above a moving average, but only with an even spread, average shares, trade price, and 1 minute volume meeting certain criteria. This feature allows you to take the hundreds of signals and chain them together into a Signal Chain. 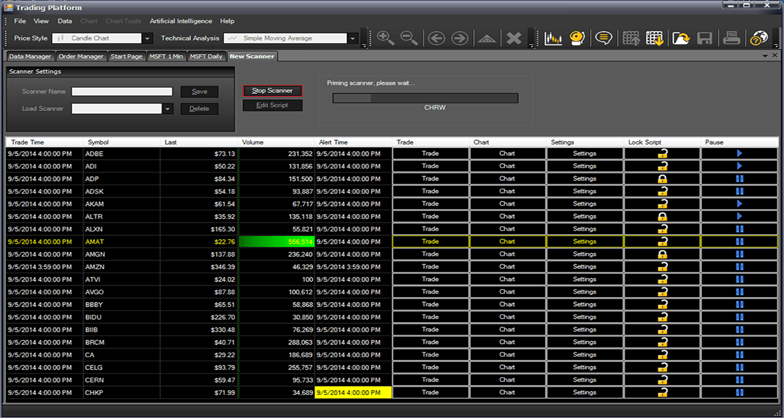 As an example, this feature can allow users to scan the entire stock market and detect when multiple conditions occur. Automated trading allows any signal, group of signals, or signal chain to be traded automatically. The user can set specific profit and loss exit points to control the automatic trading. Users can even set maximum numbers of orders or maximum numbers of positions to be created over a specific time! Finally, the trader can write their own black box trading system.